Formulating a homemade deck cleaner is not only simple, but it's often more economically and ecologically friendly than what you find in the aisle of your grocery store. Next time it's time to clean your deck, try a homespun concoction that will effectively get the job done on the first try. The following are only a few recipes to try. Ask around to your favorite neighbors or stay at home moms if you are looking for even more great ways to clean your deck thoroughly and efficiently. If you live in a region with a high level of moisture in the weather, you may encounter issues with mildew and/or algae on your deck. This is especially true if the deck is regularly in a shaded area, and this development of bacteria can be unhealthy and unsightly. Use 1.5 cups of TSP to every two gallons of warm water. Throw in 1 cup of the bleach if there is an excessive amount of mold. If you are concerned about too strong of a mixture, start with only one cup of TSP and be sure to always use powdered oxygen bleach because liquid chlorine bleach can damage the wood. 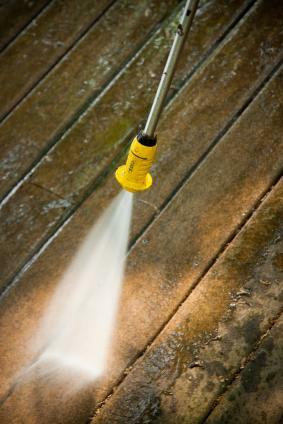 Wash down your deck with the hose, which opens up the wood and makes it much simpler to clean. Then, use a scrub brush attached to a long pole or handle so you are not down on your hands and knees breathing in the TSP and bleach. Hose off the mixture and repeat if necessary. While too harsh for regular cleaning, this recipe gives your deck a good scrub down once or twice a year. Add 2 cups of the bleach to two gallons of water. Pour in 1/4 cup of dish detergent and mix well until it suds. Use a broom or another large brush and cover entire deck. Scrub where there is stubborn dirt and grime and then rinse off. Named after the man who invited it, this cheap and extremely simple recipe has proven to work as effectively as store bought brands. However, it does call for liquid bleach which, as mentioned previously, can potentially damage the structure of the deck's wooden surface, so be forewarned. Mix together 1 gallon of water, 1 quart of bleach (ensure it is inexpensive laundry bleach), 1 pint of rubbing alcohol and 2 tablespoons of Murphy's (or another ammonia-free detergent). After the ingredients are mixed, simply brush it onto your deck and rinse very thoroughly with hose water. Remember to always mix your solution outside, or in a very well-ventilated room. Also, check the warning on any bottled chemicals you use, to ensure they will not adversely mix with another ingredient in your recipe. Failure to do so can result in a chemical reaction that can be very dangerous. Finally, keep all deck cleaner away from small children. This can be trickier if you don't have a contained, factory-made container, so designate a bottle or bucket for your cleanser that will remain out of reach at all times.